A number is a Spy number, if sum and product of all digits are equal. Number 123 is a Spy number, sum of its digits is 6 (1+2+3 =6) and product of its digits is 6 (1x2x3 = 6), sum and product are same, thus, 123 is a spy number. // create object of scanner. // you have to enter number here. // read entered number and store it in "n". // calculate sum and product of the number here. // compare the sum and product. This program checks if a number entered is a Neon Number or not, in JAVA. A number is said to be a Neon Number if the sum of digits of the square of the number is equal to the number itself. Example- 9 is a Neon Number. 9*9=81 and 8+1=9.Hence it is a Neon Number. while(square!=0)//Loop to find the sum of digits. The number is entered through Scanner class and then its square is taken by multiplying the number 2 times.After that we find the sum of digits of the square and check if the number is equal to the sum of digits of square of the number. Write a Java program to classify Abundant, deficient and perfect number (integers) between 1 to 10,000. In number theory, an abundant number is a number for which the sum of its proper divisors is greater than the number itself. The integer 12 is the first abundant number. Its proper divisors are 1, 2, 3, 4 and 6 for a total of 16. Deficient number: In number theory, a deficient number is a number n for which the sum of divisors σ(n)<2n, or, equivalently, the sum of proper divisors (or aliquot sum) s(n)<n. The value 2n − σ(n) (or n − s(n)) is called the number's deficiency. As an example, divisors of 21 are 1, 3 and 7, and their sum is 11. Because 11 is less than 21, the number 21 is deficient. Its deficiency is 2 × 21 − 32 = 10. 1, 2, 3, 4, 5, 7, 8, 9, 10, 11, 13, 14, 15, 16, 17, 19, 21, 22, 23, 25, 26, 27, 29, 31, 32, 33, ……. Perfect number: In number system, a perfect number is a positive integer that is equal to the sum of its proper positive divisors, that is, the sum of its positive divisors excluding the number itself. Equivalently, a perfect number is a number that is half the sum of all of its positive divisors (including itself) i.e. σ1(n) = 2n. The first perfect number is 6. Its proper divisors are 1, 2, and 3, and 1 + 2 + 3 = 6. Equivalently, the number 6 is equal to half the sum of all its positive divisors: ( 1 + 2 + 3 + 6 ) / 2 = 6. The next perfect number is 28 = 1 + 2 + 4 + 7 + 14. This is followed by the perfect numbers 496 and 8128. Q) What is polymorphism ? Ans) The ability to define a function in multiple forms is called Polymorphism. In java, c++ there are two types of polymorphism: compile time polymorphism (overloading) and runtime polymorphism (overriding). Method overriding: happens when a child class implements the method with same signature as a method in a parent class. When you override methods, JVM determines the proper methods to call at the program’s runtime, not at the compile time. Method overloading: happens when several methods have same names but different number or type of parameters. Overloading is determined at the compile time. Different method signature and different number or type of parameters. Same method signature but different number of parameters. Q) What is use of serialVersionUID? Everytime an object is serialized the java serialization mechanism automatically computes a hash value. ObjectStreamClass's computeSerialVersionUID() method passes the class name, sorted member names, modifiers, and interfaces to the secure hash algorithm (SHA), which returns a hash value.The serialVersionUID is also called suid. So when the serilaize object is retrieved , the JVM first evaluates the suid of the serialized class and compares the suid value with the one of the object. If the suid values match then the object is said to be compatible with the class and hence it is de-serialized. If not InvalidClassException exception is thrown. So, if no suid is present, inspite of making compatible changes, jvm generates new suid thus resulting in an exception if prior release version object is used . The only way to get rid of the exception is to recompile and deploy the application again. then if any of the metioned compatible changes are made the class need not to be recompiled. But for incompatible changes there is no other way than to compile again. Q) What is the difference between final, finally and finalize() in Java? Ans) final - A final variable acts as a constant, a final class is immutable and a final method cannot be override in a child class. finally - finally keyword is used with try-catch block for handling exception. The finally block is optional in try-catch block. The finally code block is always executed after try or catch block is completed. The general use case for finally block is to close the resources or clean up objects used in try block. For e.g. Closing a FileStream, I/O stream objects, Database connections, HTTP connections are generally closed in a finally block. finalize() - This is the method of Object class.It is invoked before an object is discarded by the garbage collector, allowing it to clean up its state. Should not be used to release non-memory resources like file handles, sockets, database connections etc because Java has only a finite number of these resources and you do not know when the garbage collection is going to kick in to release these non-memory resources through the finalize() method. Q4)What is difference between HashMap and HashTable? Hashmap is not synchronized in nature but hashtable is(thread-safe). This means that in a multithreaded application, only one thread can gets access to a hashtable object and do an operation on it. Hashmap doesn't gurantee such behavior and is not used in multithreaded environment. Hashmap is traveresed using an iterator, hashtable can be traversed by enumerator or iterator. HashMap permits null values and only one null key, while Hashtable doesn't allow key or value as null. Q) What is difference between abstract class and interface ? Ans) A class is called abstract when it is declared with keywordabstract. Abstract class contains atleast one abstract method. It can also contain n numbers of concrete method. Interface can only contain abstract methods. Interface can have only abstract methods. Abstract class can have concerete and abstract methods. The abstract class can have public, private, protected or default variables and also constants. In interface the variable is by default public final. In nutshell the interface doesnt have any variables it only has constants. A class can extend only one abstract class but a class can implement multiple interfaces. Abstract class doesn't support multiple inheritance whereas abstract class does. If an interface is implemented its mandatory to implement all of its methods but if an abstract class is extended its mandatory to implement all abstract methods. Q) What is the difference between equals() and == ? Ans) == operator is used to compare the references of the objects. public bollean equals(Object o) is the method provided by the Object class. The default implementation uses == operator to compare two objects. But since the method can be overriden like for String class. equals() method can be used to compare the values of two objects. Q) What is difference between a thread and a process? Threads share the address space of the process that created it; process has it's own address space. Threads have direct access to the data segment of its process; processes have their own copy of the data segment of the parent process. Threads can directly communicate with other threads of its process; processes must use interprocess communication to communicate with sibling processes. Threads have almost no overhead; processes have considerable overhead. New threads are easily created; new processes require duplication of the parent process. Threads can exercise considerable control over threads of the same process; processes can only exercise control over child processes. Changes to the main thread (cancellation, priority change etc.) may affect the behavior of the other threads of the process; changes to the parent process do not affect child processes. Q) What is use of synchronized keyword? Ans) synchronized keyword can be applied to static/non-static methods or a block of code. Only one thread at a time can access synchronized methods and if there are multiple threads trying to access the same method then other threads have to wait for the execution of method by one thread. Synchronized keyword provides a lock on the object and thus prevents race condition. E.g. Q)Is garbage collector a dameon thread? Ans) Yes GC is a dameon thread. A dameon thread runs behind the application. It is started by JVM. The thread stops when all non-dameon threads stop. Q)How is Garbage Collection managed? Ans)The JVM controls the Garbage Collector; it decides when to run the Garbage Collector. JVM runs the Garbage Collector when it realizes that the memory is running low. The behavior of GC can be tuned by passing parameters to JVM. One can request the Garbage Collection to happen from within the java program but there is no guarantee that this request will be taken care of by jvm. The JButton class is used to create a labeled button that has platform independent implementation. The application result in some action when the button is pushed. It inherits AbstractButton class. Let's see the declaration for javax.swing.JButton class. void addActionListener(ActionListener a) It is used to add the action listener to this object. The button class is used to create a labeled button that has platform independent implementation. The application result in some action when the button is pushed. Changing the state of an object is known as an event. For example, click on button, dragging mouse etc. The java.awt.event package provides many event classes and Listener interfaces for event handling. public void setBounds(int xaxis, int yaxis, int width, int height); have been used in the above example that sets the position of the component it may be button, textfield etc. Java AWT (Abstract Window Toolkit) is an API to develop GUI or window-based applications in java. Java AWT components are platform-dependent i.e. 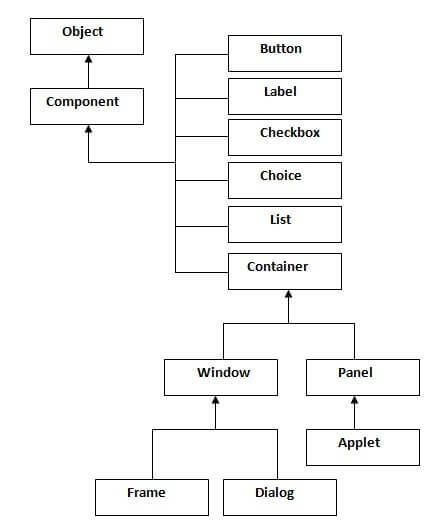 components are displayed according to the view of operating system. AWT is heavyweight i.e. its components are using the resources of OS. The java.awt package provides classes for AWT api such as TextField, Label, TextArea, RadioButton, CheckBox, Choice, List etc. The hierarchy of Java AWT classes are given below. The Container is a component in AWT that can contain another components like buttons, textfields, labels etc. 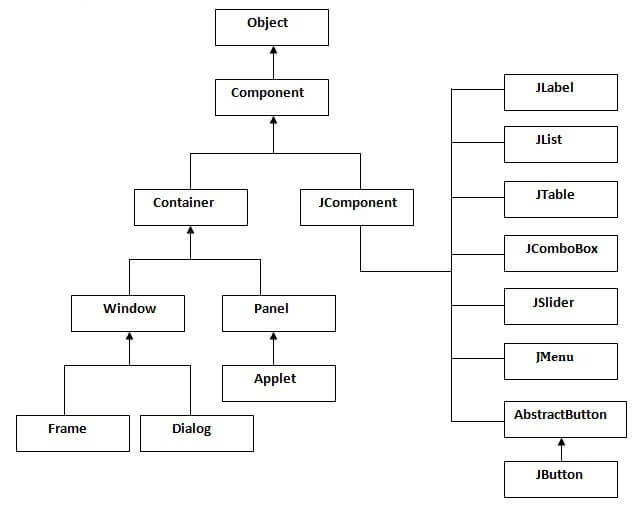 The classes that extends Container class are known as container such as Frame, Dialog and Panel. The Panel is the container that doesn't contain title bar and menu bars. It can have other components like button, textfield etc. The Frame is the container that contain title bar and can have menu bars. It can have other components like button, textfield etc. public void add(Component c) inserts a component on this component. public void setSize(int width,int height) sets the size (width and height) of the component. public void setLayout(LayoutManager m) defines the layout manager for the component. public void setVisible(boolean status) changes the visibility of the component, by default false. To create simple awt example, you need a frame. There are two ways to create a frame in AWT. Let's see a simple example of AWT where we are inheriting Frame class. Here, we are showing Button component on the Frame. The setBounds(int xaxis, int yaxis, int width, int height) method is used in the above example that sets the position of the awt button. Let's see a simple example of AWT where we are creating instance of Frame class. Here, we are showing Button component on the Frame. If you want to represent any object as a string, toString() method comes into existence. The toString() method returns the string representation of the object. If you print any object, java compiler internally invokes the toString() method on the object. So overriding the toString() method, returns the desired output, it can be the state of an object etc. depends on your implementation. By overriding the toString() method of the Object class, we can return values of the object, so we don't need to write much code. Let's see the simple code that prints reference. Now let's see the real example of toString() method. In this example, we have created a final class named Employee. It have one final datamember, a parameterized constructor and getter method. The instance variable of the class is final i.e. we cannot change the value of it after creating an object. The class is final so we cannot create the subclass. There is no setter methods i.e. we have no option to change the value of the instance variable. 1) StringBuffer is synchronized i.e. thread safe. It means two threads can't call the methods of StringBuffer simultaneously. StringBuilder is non-synchronized i.e. not thread safe. It means two threads can call the methods of StringBuilder simultaneously. 2) StringBuffer is less efficient than StringBuilder. StringBuilder is more efficient than StringBuffer. Let's see the code to check the performance of StringBuffer and StringBuilder classes. 3) String class overrides the equals() method of Object class. So you can compare the contents of two strings by equals() method. StringBuffer class doesn't override the equals() method of Object class.